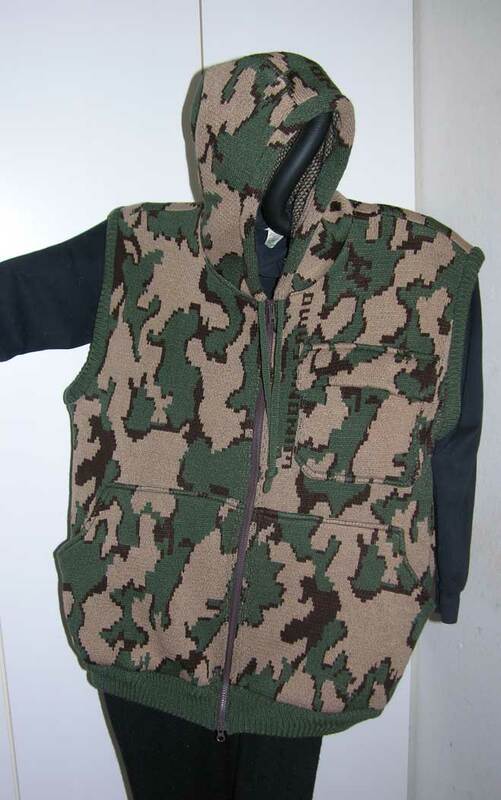 Camouflage Style Hoodie Vest with full Zipper Front, Double 1 x 1 Ribbing at arms and bottom , and hand warmer pocket. 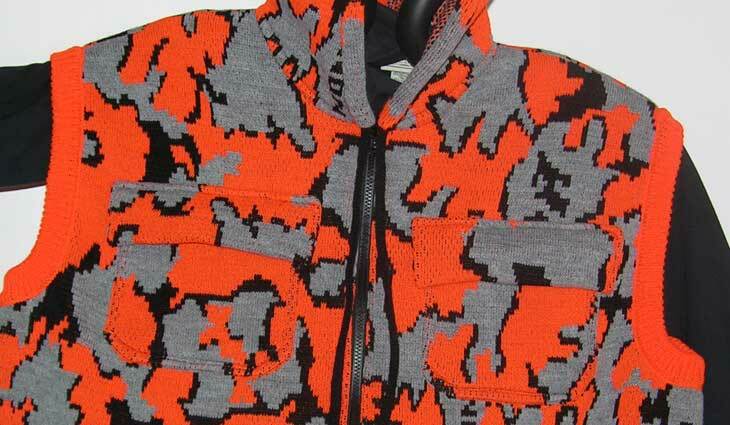 Choose between several Color Combinations Our sweater in the photo is pictured in Camo Colorway R: Orange (color 1) / Black Shadows (Color 2) / and Grey (Color 3). 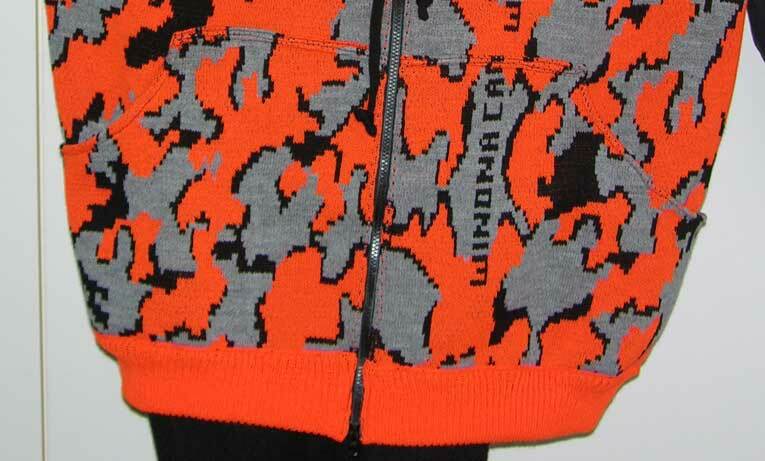 This color way is only available in the classic version because we do not have orange merino wool. Machine Wash Cold Water/ Machine Dry Knit Cycle: do not use hot water or hot dryer setting: this would stretch any acrylic fibers. 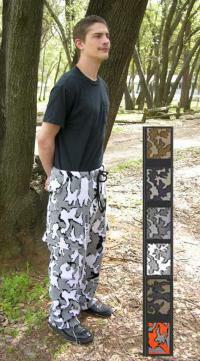 Turn garment inside out when washing to keep it looking like new. Rubbing action on acrylic knits could fuzz or pill some yarns. I have found that our acrylic yarn holds up very well under theses standard machine washing and drying instructions. 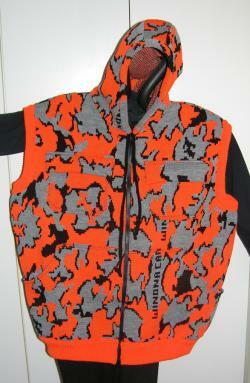 Each vest is individually hand loomed and assembled. It is NOT a mass produced item. 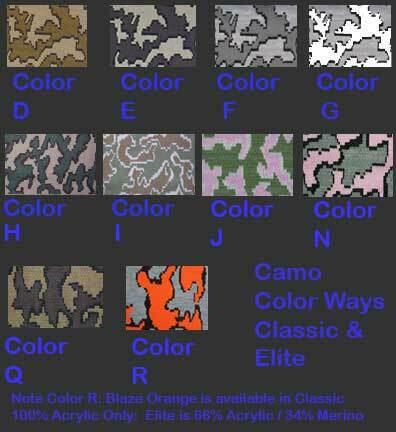 We get requests from our clients to have Camouflage Styles added to our line to meet different hunting or fashion needs. Some want the superfine merino / acrylic blend for the naturally insulating and moisture wicking charactoristics; others prefer the 100% acrylic for fast and easy care. This style fills another one of those requests. Submitted by sharon on Wed, 03/04/2015 - 14:47.